The Cri-Kits pens are so much fun to play with. I wanted to try something different and I know that making tags is really hot now, so here is what I came up with. Thank you thank you thank you. I have learnt so much in this tutorial ie the page thingy on the Gypsy and what to do with my cricut pens. The tag is gorgeous, another thing to put on my to do list. This is so awesome! I might have to surprise my sister for her birthday and put one of these "knock you socks off" tags on her gift!! Priceless! Great lesson on how to use my Gypsy. So far the lessons I've taken has just gone over my head. Thanks again. Great video, I always learn a lot from you. Thank you. I never knew what the Gypsy did, thanks for the tutorial. Great video. I use pens with my cricut too and love it. My son is a machinist and made me my cricut pen holder. I use it all the time. I can get the pens at staples real cheap. Thanks again for making the video. Great tag, thanks for the tutorial, I was wondering why they had the option to go back to the gypsy application without unloading the paper, your video expained it. I love all the techniques you used on the tag. SO pretty - now I am going to have to start buying Crikuts! what a great tutorial! thank you for sharing. This is a beautiful tag. I think I'm going to make something similar for my mother. Thanks for another great video. 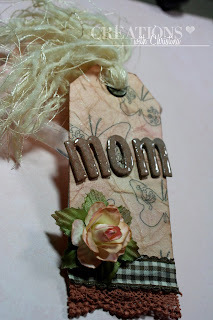 I love this tag and you gave us so many different techniques to use. wonderful!! That was so beautiful! Thank you for sharing it. You put so many beautiful techniques into. I learned a lot! Thank you! Thank you so much for making this video. I am going to order Cri-Kits pens, what a difference they make to a project. Great project. Loved the video. You have the best projects and videos. I always learn so much. I am writing so fast trying to write down everything as you are talking. I have a huge shopping list after each of your videos. I just love watching and learning from you. Thank you so much. thanks so much for the great tutorial. I found this very informative. So pretty as usual you made a complex Gyspy feature seem so easy. I now know why the Grey image appears on each page...you rock! Thanks for this great video - you always inspire me with your wonderful ideas. That turned out so beautiful. Thanks for all the suggestions and tips. Great Job Christina! I am now going to have to get the cri-kit pens. LOL Any Mom would love to receive that tag from their daughter. Beautiful tag and great video - thanks! I learn so much from watching your videos. Thank you. Beautiful tag! Wow, excellent job, I learned a lot about my new gypsy, thank you! This is stunning, it seems everytime I visit you I learn something new. I have watched this video about 20 times. I just love it...something very relaxing about it. I just ordered those pens, I think they will be so fun to work with. Another project added to my list. Thank you Christina.